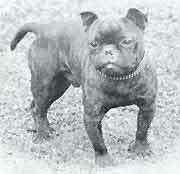 The miniature small bulldog is thought to have been crossed with the native "terrier boule" ( not to be confused with the Bull Terrier), also called "ratier" (as it was used to chase rats) owned by butchers and other meat trade workers in the abbatoir areas in the suburubs of Paris, De Villette and Pantin, which looked like a terrier or small bulldog and eventually giving rise to the French Bulldog. Other breed historians claim they were also crossed with the pug but lack of records has so far frustrated researchers to establish the breed's exact genealogy. A little later the coach drivers, shoemakers and street traders and even the police became fans of the "petite Boule". It soon became the star of working class Parisian society. Its physique, small size, peculiar physiognomy and enchanting personality made it the darling of fanciers of flatfaced dogs. As the new, smaller Bulldogs gained popularity in France, they became favourites of the Parisian "Belles De Nuit" ("Ladies of the Night"), the courtesans, who kept it for its excentric appearance. It was during this period that the upper classes, through their coachmen and bordellos, began to discover and fall under the charm of this small dog with its persuasive and at times disturbing look. 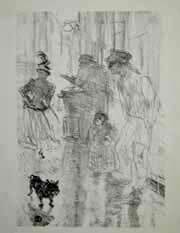 The aura of notoriety that ownership of the little dogs conveyed soon made them a fashionable way for the well to do classes to show off how daring they could be, and they soon became favourites of the "artistic" set across Europe, often being depicted in brothels by artist of that day, like Degas and Toulouse Lautrec in his picture "Le Marchand des Marrons" (1897). Mistinguette, Colette, Mac Orland, King Edward VII with his dog Peter in England, count among the more notable fans of the breed. Photos dating from around this time show the Russian Royal family posing with their French Bulldogs. They were said to have imported several of the little dogs from France. In Austria, Germany and of course the USA the breed began to acquire more and more popularity. It is also thought that due to its reputation for strength and tenacity, sterling qualities in those days of sail, they became appreciated by seafaring men all over the world which made them soon popular on other continents. 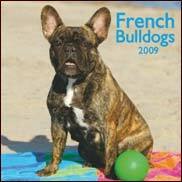 The French Bulldog's real success however began in 1880, when a group of parisian Frenchy breeders and fans began to organise regular weekly meetings. In 1885 the first provisional register of the breed was established and the French Bulldog participated in an exhibition under its own breed name for the first time in 1887. 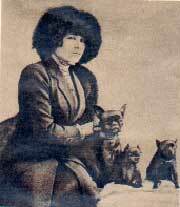 It is inarguable that without the influence of these dedicated, turn of the century American fanciers the breed would not be what it is today. 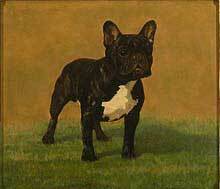 The French Bulldog first appeared in the United States in 1896 at the Westminster Kennel Club's show in New York. He soon became known as "Frenchie," a name that stuck with him. Even though he looked at first sight as a miniature bulldog, his bat-like ears, held erect, the flat skull between the ears, his small size and his activeness set him apart from the Bulldog. He had a lively expression and a disposition described by some as roguish and fun loving . He's been referred to as "a clown in the cloak of a philosopher." The American fanciers of the breed organized the very first French Bulldog Club in the world, and insisted on the fact that the "bat" ear so associated with the breed today should be considered the correct form. Until that time, French Bulldogs were shown with either the "bat" or "rose" ear. 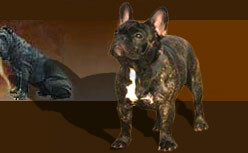 Indeed, in 1897, exhibitors, disappointed because an English judge picked a Frenchie with rose ears for his best of breed, called a meeting and formed the French Bull Dog Club of America (the first breed club for French Bulldogs in the world) and the next year adopted a standard which remains essentially unchanged today. American tourists discovered the little French Bulldog and began bringing them home. The French Bulldog is one of only a few breeds, which owes its existence to the efforts of breeders in different countries - France, America, England and Germany. Certainly the continuance of the unique bat ears at the turn of the century was due largely to America and there was immense popularity for the frenchie in America from a century ago and continuing for at least thirty years. The following year the club was formally consituted with Marcel Roger, a great admirer of the breed, as founding president. However it lasted another ten years before the French Canine Society began to take the breed seriously. This happened when the Central French Canine Society suggested that the society formed by Gordon Bennet ( the French Bulldog Lovers' Club) and Marcel Roger's club joined together. Both parties saw the advantages of this union and so the Bouledoge Club of France as we know it today came into existence. The president was Menans de Corre and the vicepresident Gordon Bennett.